Publisher's Note: This is something new. Pierson, Henry, Brian, Joey, and Joe got together for a 2-hour Slack conversation. It's like a podcast, except with words (3,500 of them) and no awkward pauses. Pierson: Tech came out of the gates firing on Friday night, jumping out to a huge lead against Saint Louis before ultimately falling back down to earth. I don't know about you guys, but I was cackling like an idiot as the Hokies looked every bit like a top flight team. I'm interested in everyone's thoughts on how Tech could start out so hot in the first half against Saint Louis and then follow it up with three underwhelming halves. Henry: I too was giddy. Practically prancing around the hotel room in San Diego while trying not to get my expectations too high. I think the underwhelming second half on Friday was a combination of adjustments by Saint Louis and Tech taking the foot off the gas pedal. I'm not as sure about the Liberty game. Give some credit to the Flames' defense but it's not that great. It seemed like Tech was trying too hard to blow Liberty out of the water and make another statement. It's not necessarily worrying going forward because I they're playing with house money now. Brian: I don't think the two games are related at all. Against Saint Louis they came out and dominated, then took their foot off the gas (as one does when you're up by seemingly 70 points at half). And against Liberty, they were tight. But doesn't that make sense? They were in the ultimate lose-lose situation. Pierson: I agree on the no-win situation for the Hokies facing the Flames (even though Liberty is probably the only underdog that would struggle to capture the hearts and minds of neutral fans in attendance). Somewhat predictably, every tournament re-seed this week has placed Tech firmly in the #15 slot in front of Oregon because they haven't won a blowout. But has Tech been a team that blows opponents out this season? Brian: LOL not post Justin. Henry: Yeah, they slowed everything way the hell down once J-Rob went down. Brian: I mean, especially because they were playing for the right to be the most successful Tech basketball team in school history. They just weren't going to blow Liberty out. The game meant too much to come out loosey goosey. Joe: I am not sure I would necessarily agree that it was three underwhelming halves in a row. 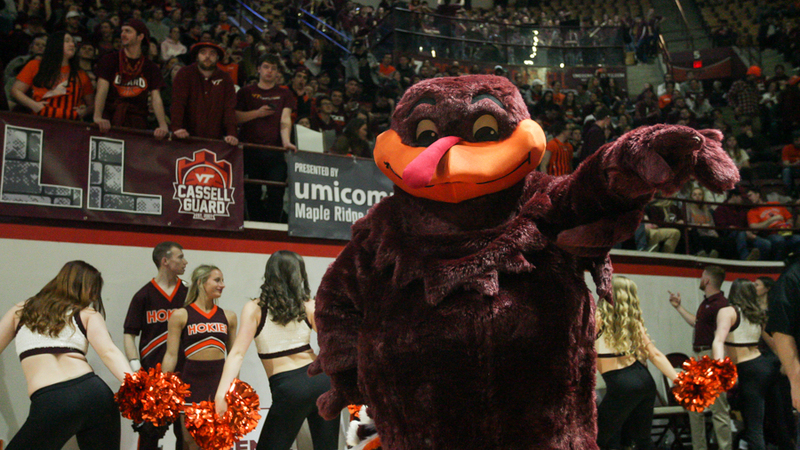 The Hokies outscored the Flames 38-26 in the second half. Liberty, which is a solid shooting team, shot 27.3% FG and 23.1% 3PT. They average 56.4% and 36.8%, respectively, on the season. Tech trailed, then cranked up the intensity in the final half, which is exactly what you want to see the favorite do. Alpha out. Pierson: Earlier in the season, literally a week before Five got injured, I was in the process of writing an article comparing Tech's season to Liverpool's 2018-19 Premier League campaign. Essentially, I was breaking down how great teams set themselves apart from the pack by competing against top-level talent while also controlling games against lesser opponents. That ability to get on and off the gas when necessary is an important trait amongst elite teams. And while it can lead to closer-than-expected scores and some nervy spells, it allows teams to dial back the intensity and dictate play. Tech was obviously unable to play that way in Robinson's absence, but they've controlled the pace of play more often than not with Five in the rotation. Brian: Joe's right about the second half. Big dogs come to eat with the game on the line. Is it weird that I kind of forgot how the team looked with Robinson? I'd gotten so used to defense-first/walk-it-up offense, that when he threw that first lob to Hill against the Billikens it reminded me of how good they were pre-injury. Henry: It was legitimately weird to see them push the ball in transition. Brian: HE'S SO MUCH BETTER NOW. Pierson: His presence opens up so much more for the offense. Not only do you feel better about him shooting the three than Bede, but ball movement is so much quicker. Joey: And he doesn't have six live-ball turnovers a game anymore, which is nice. Joe: Regarding the missed layups, and other lapses in play, NAW has the tendency to make you question why all these mock drafts have him as a lottery pick, but then as quickly he strings together a few spectacular minutes and erases any doubts of his abilities. Pierson: He definitely lacks consistency, but NBA scouts are all about upside and NAW's two-way play shows a ton of promise. He's not a dominant collegiate player, but (as you mentioned) he has the ability to dominate in spurts. Joe: I like Tech's chances against Duke more if he's dominant for a 40-minute stretch. Pierson: Really going out on a limb there Joe. Next level analysis. Joey: To be fair, he's also on a damn good basketball team with Five in the lineup. It's tough for any one guy to be truly dominant offensively with Justin Robinson, Kerry Blackshear and NAW on the floor together. Put differently, gone are the days of "get out of Erick Green's way". Pierson: Let's talk about Duke.